Over 3,000 protesters have gathered in Moscow to call for science and education reforms in Russia, amid budget cuts and the closure of a leading scientific foundation over a “foreign agent” tag. About 3,500 protesters have gathered at central Moscow’s Suvorov Square demanding the Russian government support scientific research and education by increasing its budget, providing self-governance and autonomy in education and science and to respect academic freedoms. “We [also] demand an immediate stop to the persecution of science and education organizations, charity funds, as well as other non-profit organizations using the tag ‘foreign agent’ or the equivalent,” the protesters’ resolution said. 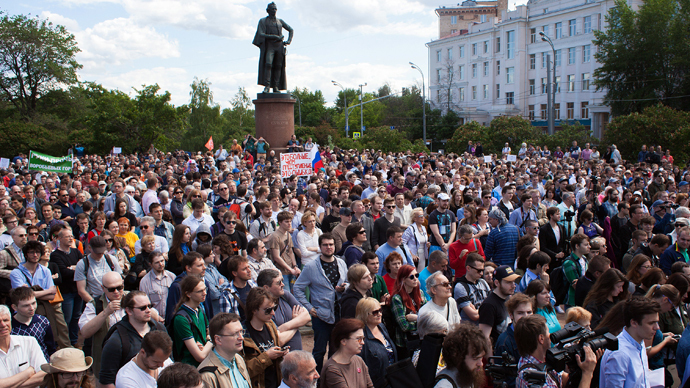 Opposition politicians such as Aleksey Navalny joined the protests, along with journalists, human rights activists and students. The protest follows the closure of The Dynasty Foundation after the government branded it a “foreign agent” on May 25, a tag applied to non-governmental organizations (NGOs) that receive funding from abroad and engage in political activities. Dmitry Zimin, the 82-year-old founder of the organizational and a telecoms tycoon, has argued that he financed the foundation from personal bank accounts located abroad. Shortly after the Dynasty Foundation’s closure he left Russia. The Dynasty Foundation was established in 2002 as a non-profit organization to aid the development of fundamental scientific research and education, the popularization of science, civic education and help projects in the sphere of culture. The planned 2015 budget for programs and projects of the foundation was 435 million rubles (about $7.7million). The Ministry of Justice is not going to review its decision unless the organization stops being funded from abroad, said Aleksandr Konovalov, the ministry’s head, as cited by RIA Novosti on Thursday. The “Foreign Agents Law,” introduced in Russia in 2012, specifies that all NGOs receiving funding from abroad and even partially engaged in political activities, must register as foreign agents. In May, President Vladimir Putin signed a bill banning the activities of foreign groups that pose a threat to national security. In 2013, Vladimir Putin signed a law to reform the Russian Academy of Sciences, the country’s leading scientific research establishment comprising about 50,000 researchers in over 400 institutions. Under the law, the management of most of the academy’s property was transferred to a new federal government agency.